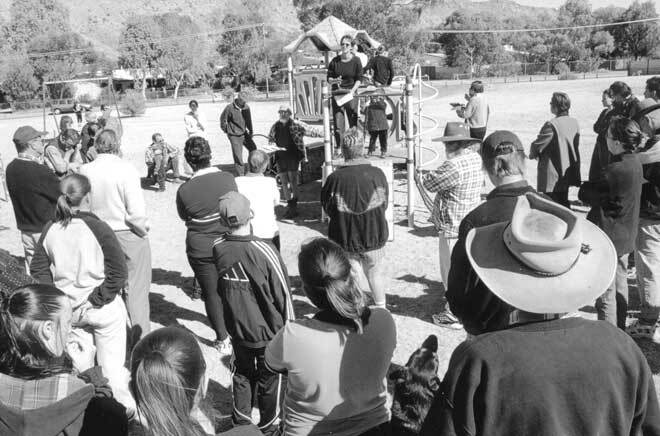 Local residents rally to save Finlayson Park in June, 2001. Their voices were heard. From our archive. UPDATE, September 16, 2012, 2.20pm: With next to no discussion of the parks issue taking place in the open session of council meetings, it is not surprising that confusion has arisen. The draft report referred to in this article, identifying certain park assets for possible disposal and others for possible improvement, was included in the September committee meeting business papers but actually dates from 2004. This is not made clear on the cover of the draft, nor in the document to which it is attached, but only in small print at the bottom of each page of the draft. Nonetheless the contents of the report are of relevance to council’s current consideration of Cr Geoff Booth’s request that a forecast of “savings on maintenance” be made “as a result of reducing the number of insignificant land [parcels] currently zoned as parks”. Apart from the public (and this journalist) councillors and officers would seem also to be confused about the issues. The recommendations A to E provided by officers do not match the A to E points of Cr Booth’s original notice of motion. Specifically Cr Booth’s notice of motion contained no reference to the redevelopment of Ashwin and Finlayson Parks. Cr Eli Melky asked in the last committee meeting how come the redevelopment of those parks – which he described as “welcome” – had slid into the the report. Deputy Mayor Brendan Heenan said costings would be needed before councillors could vote to proceed. Officers were asked to go back and “correct” the report by Mayor Damien Ryan. Apart from wanting clarity regarding the confusion mentioned above, he was particularly exercised by the “Adopt a Park” report, part of the same agenda item and another facet of Cr Booth’s original notice of motion. He was “amazed” by its failure to get answers to the questions posed on the issue. An issue which has previously generated a lot of heated debate, is quietly making its way through council’s Technical Services committee system, with a number of parks in the municipality now identified for possible disposal. Last year Councillor Eli Melky proposed that council could raise funds from the sale of “surplus land” designated as parkland, while developing remaining parks with better facilities. At the time he thought that only up to four ‘parks’ were suitable for sale. There was uproar. The issue had been dormant since 2001 when a community outcry stopped a council proposal to sell off six local parks. Now, in an initiative driven by Cr Geoff Booth, council has for its consideration a draft list identifying six parks for disposal plus a further four for partial disposal, with an estimated return of $1.65m to council coffers. Some (possibly all) of this money would go into upgrading and developing other parks. 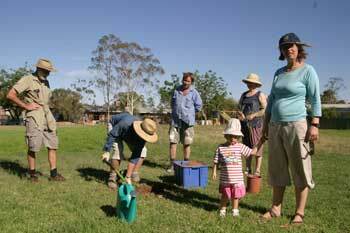 Council spends over $2m annually on the maintenance of open space, including parks and ovals. The disposal list – contained in a draft report provided to elected members by Scott Allen, council’s works manager – identifies another three parks for return or partial return to the Crown. Mr Allen and staff developed an assessment system to work through the issues, scoring each park against 10 criteria, including size, utilisation, security, accessibility, and environmental values. Some parks, although low-scoring, have not been recommended for disposal. These are Tucker (retain and upgrade), Gilbert (develop as a bush park), Reus (retain as a drainage easement), Spearwood (retain as a bush park), Lewis Gilbert (retain and improve), Ashwin and Finlayson (retain and improve both, in response to vocal residents’ desires) and Acacia (develop as a bush park at the gateway to town). The parks recommended for disposal are: Walmulla (too small to be useful), Westland (with the exception of a possible sacred site, which would be returned to the Crown), Campbell (at right, residents tree-planting in this park in 2008), Rotaract East, Tmara Mara, Bowman and Kempeana (their disposal to be offset possibly by development as a park of better vacant land in the area), and Newland (to be consider for redevelopment as a retirement village). Some other parks may have a sacred site within their boundaries and this has yet to be verified. In these cases the recommendation, as with Westland, is to return the sacred portion to the Crown. They include Maynard (the rest of the park to be upgraded) and Warber (develop as a bush park if not sacred). Parks recommended for partial disposal are Oleander and Eagle. It is also suggested that the pedestrian walkways on Bowman and Kempeana be retained. • a feasibility study for an “Adopt a Park” scheme. An earlier report to council earmarked the following parks for potential development as precinct parks, sized between 8000 and 28,000 sqm, and to be equipped with a certain level of infrastructure including barbecue and public toilet. They are Frank McEllister (already a precinct park for Gillen), Rotarac Park (Northside), Frances Smith Memorial Park (Eastside), Aquatic and Leisure Centre (CBD), Albrecht Oval (Larapinta). In the smaller Industrial and Golf Course areas, Spicer Crescent Park and Lewis Gilbert Park are to serve as neighbourhood parks. The Gap area misses out in this list and has only three small local parks apart from Acacia, which is owned by the Crown and is recommended for development as a bush park. One of the three small parks is recommended for disposal. The draft report recognises the sensitivity of the issue and recommends “extensive community consultation and sympathetic hearing of the view of the residents”. The report in full can be found in the business paper for last Monday’s Technical Services committee meeting (September 10) on council’s website. A former alderman on the Alice Springs Town Council posed a question to me this evening. Aren’t the parks in Alice Springs the property of the residents of Alice Springs, and if so, can Council legally sell them? To Eli Melky (Posted September 18, 2012 at 1:34 pm): If you deny misinterpreting what Gillam said, does this then mean you are making an admission that you are deliberately distorted his meaning? No did not misinterpret the meaning at all. @3: Hal, please reconsider your pledge to Cr Eli to “refrain from asking you any more specific questions outside of Question Time during Council meetings”. Having a debate in this online newspaper is as much a democratic exercise as is sitting in the town council’s public gallery. Except here vastly more people see it than would fit into that gallery, or are bothered to go there. To Eli Melky (Posted September 17, 2012 at 11:28 am), when you say that Mike Gillam “suggests that there is a conspicuous plan to neglect some parks in order to sell them off”, you are clearly misinterpreting the meaning of Gillam’s post. “Conspicuously” as Gillam has used it means obviously, visibly, noticeably. It does not necessarily imply that this has been “planned” or is “deliberate”, just that it is plain to see; it could just as easily be unplanned and accidental, or caused by innocent oversight, or through lack of time or resources. Actually Eli, I was responding to the concept of measuring the usage of a park, run-down and denied adequate maintenance, and incorporating this into a scoring system to decide its fate. Specifically I was concerned by the disparity between Council’s own findings and Hal’s observations of usage and need at Walmulla park. Greater analysis should be directed at the potential of pocket parks in a future urban landscape where increased living densities will lead to ever shrinking personal outdoor space / courtyards. Will Councillors oppose the spread of unit-scapes in neighbourhoods where local parks have been sold off? I doubt it. It does not follow that small parks are without merit because they lack an acre of lawn – small / local parks can help to grow a sense of neighbourhood and community. The points made by Bev Emmott are well reasoned. Such places allow parents to corral their small children and meet with neighbours and yes, it helps if there are at least some shade trees and a bench seat. It seems probable that two similar parklands in comparable urban settings are likely to record vastly different usage if one is well kept and the other neglected – I don’t think we need to invest in a full-scale physical experiment to see the logic. Finally, do Councillors appreciate the immense “untapped” potential of involving local residents in the day-to-day management of parks? The land management skills base of this town is remarkable. The Land for Wildlife programme is hugely successful and private landowners demonstrate a high degree of competency and commitment in their management of bushland within and outside the municipality. I can cite many examples in the public domain where the efforts of volunteers are visible – from land management in the river (retired ecologist) to a hopeful garden bed in the mall (local businessman and former horticulturalist). Passionate and informed volunteers living in the immediate area make all the difference at Gosse Street, Day Street and other urban parks. Imagine the possibilities if this culture was actively encouraged by the Town Council. Fair enough Eli, and I will refrain from asking you any more specific questions outside of Question Time during Council meetings. It was a bit rhetorical anyway. I realise yours is but one vote of nine. However, I do think your reply begs the question I did ask. If Council is managing our many parks on its current budget, why sell any? I look forward to the debate and the public consultation. The river is another matter, and I do hope Council finds the funds to slash the eastern bank. That’s where all the river fires have been this season, and the one at the end of the Taffy Pick Bridge cost us another Old-Man River Gum. Either that or get the firies to do some controlled burns. An open spaces coordinator might not be a bad idea. Mike Gillam could be onto something workable here. If he/she were to work in with the community through an adopt-a-park program, or adopt-a-riverbank, and have it all overseen by Council, it might be surprising what help emerges. Dear Hal regarding your post September 16, 2012 at 7:42 am and your specific question to me, “Does this Council plan to redevelop Ashwin and Finlayson parks? As you know following Councillor Booth’s request to receive a report relating to the parks, (details of the request motion can be found in the main report above), elected members have now received such a report. Elected members will now discuss this issue. Where to from here? As I cannot speak on behalf of other elected members, I am unable to predict an outcome. Rest assured though that any decision arrived at would no doubt include public consultation. On the issue of the River, this is a separate matter and will no doubt be discussed in due course. As to your comment “Clearly the management of our parklands within budget is proving a task beyond the current set-up, just as the recent fires on the east side of the Todd show what happens when an area escapes being slashed”. I don’t agree with you that it is as clear as you say. Managing our limited budget to cover an ever growing demand for service from our community will always be challenging, no matter the size of the budget. In my view the management of finances is a skill for qualified and capable personal, and I am more than satisfied Council has appointed such staff as overseen by a very professional and capable CEO. So to the Comment by Mike Gillam Posted September 15, 2012 at 11:04 am. It suggests that there is a conspicuous plan to neglect some parks in order to sell them off … So by that you mean that either, elected members have given direction to officers to neglect some parks, all be it conspicuously. Or the officers are doing this on their own whim and elected members are sitting back and watching helplessly but conspicuously. Wow really Mike? For the record I would not support the idea of a coordinator as I am very confident that our current Council staff provide an excellent service not withstanding budget constraints. Hal and others, while I don’t mind from time to time replying via the Alice Springs News page, if you have any specific questions in future, please feel free to ask them direct to elected members during public question time scheduled at the beginning of each Council meeting. I think there is now a case for a public meeting to discuss the future of our open spaces, and I would include in that both our parklands and our river. Clearly the management of our parklands within budget is proving a task beyond the current set-up, just as the recent fires on the east side of the Todd show what happens when an area escapes being slashed. Both the river and the parklands are or have recognised sacred sites, but while the parks so designated are being mentioned for returning to the NT government for future management, I remember hearing Council reject the notion of similarly returning the river. Perhaps it is time to consider an open spaces coordinator, but then I thought that was what Council was supposed to do as its day job. If a coordinator is appointed, I suggest one of his/her first tasks will be to clearly establish authority. While the cited Draft Urban Open Space Assets Report is from 2004, the fifth paper under TS agenda Item 9.6 from the last committee meetings is current. Cr Booth is mentioned in it, and its Point E is a request for direction on whether or not to proceed with the redevelopment of Ashwin and Finlayson Parks. I understand a former Council decided against this redevelopment, but after three months (?) I believe Council can revisit a decision and go the other way. I now have a specific question for Cr Melky, who has shown he is following this discussion. Does this Council plan to redevelop Ashwin and Finlayson parks? And, finally, aside from selling the Gap’s children’s playground out from under their feet, what particularly galls me about the plans for Walmulla Park is that not so long ago I asked a senior Council officer if there were plans to sell that park. He looked me straight in the eye and said, No. He lied to me. While I’ve not read Council’s document, I support Hal Duell’s observations. There is a familiar circularity in some of the arguments presented and residents should be extremely wary. Strategic placement aside, surely those parks conspicuously neglected will be used less than parks that are well maintained and therefore valued? So instead of using this as justification to sell off our embarrassing civic failures how about debating the management of parks? If the workforce can’t manage then perhaps we should consider re-structuring the organization and mobilizing neighbourhood groups. Council might employ a facilitator / coordinator, maintain support such as public liability insurance and offer modest grants for maintenance works. From a register of approved contractors I can see gardeners chosen on the basis of merit and productivity with tangible results on the ground for neighbourhoods that make good decisions. Naturally those neighbourhoods that sell produce at fund-raising picnics will be able to afford improvements beyond the baseline. This fits with the “adopt a park” focus of some Councillors. For the benefit of the town I do hope you are right. Please excuse my cynicism, but in terms of recent history as far as town council and the process of consultation with the community it does a case of same same. My e.g.’s are the Eastside roundabout, the town pool and the John McDouall Stuart statue. The month of August last year did bring an excitement of another kind as the national news reported Alice almost going up in smoke with in excess of 300 fires around Alice. Community comment understandably hit fever pitch I suppose. These days, the fire fuel load is still potentially dangerous and the camels are thirstier than ever and hopefully, the town has quietened a little. Aaagh Centralia, never dull, never insipid! Can you tell me Dear Editor, how the heck does Mayor ever get the time to tweet as you reported the other day? Cheers from D. R. Chewings aka THE lone dingo. I re twitted your story as I thought it was a report I can share and yes full of facts, however I added to the title “How a good idea is misunderstood. Get all the facts 1st.” and you assumed it is directed at your reporting … Wrong! But I can understand your reaction and I am impressed how you have included the twitter conversation here, very clever. As you may recall, when I brought this up last year, some said I had a conflict of interest and was going to sell off park after park until we ran out of parks. Elected members at the time campaigned publicly against it even though a report existed in confidential regarding this issue. When I tried to move a motion to bring that report out from confidential to open, surprise surprise no support from those elected members. Hence the statement on twitter: “How a good idea is misunderstood Get all the facts 1st”. My tweet was for those who follow my twitter account, which as I understand includes you. I don’t have an issue with the report or the reporter, but I reserve the right to express my opinion on my own twitter account. This is an exciting time in the history of Alice Springs Council where issues are being presented and ideas being discussed in a cooperative way. I look forward to bringing to council many proposals that can improve this great town. Cr Eli Melky, Don’t shoot the messenger, debate the issues. My report is a fair and balanced summary of the facts. It provides a list of parks recommended to be retained and improved, as well as those recommended to be disposed of. It points out to readers where they can find the full draft report and the report’s recommendation of extensive consultation. To be clever in how one goes about getting an issue on the agenda is not a bad thing. Now, you should try to take the discussion further. It’s all smoke and mirrors right now. First there was a 2004 report circulated as part of the papers for September’s committee meetings (20.1 TS Agenda Item 9.6 – Parks Feasibility Study – attachment A.PDF), then there was a request for direction on whether or not to proceed with the redevelopment of Ashwin and Finlayson parks (20. TS Agenda Item 9.6 – Parks Feasibility Study report.PDF). But is any of it current? I think it’s fairly certain the this council wants to shed some of our parklands. I also think they owe us clarity on their proposals and a time for public comment and consultation. Sooner or later we’ll get both the clarity and the public consultation, and then Council will sell some of our parklands. They have been angling for it for years, just as they have been angling to lose the sails in the Todd Mall. Both are about to happen. At least one of our officers knows how to play a long game. If the local young families and people within walking distance of these parks, that maybe sold – are properly consulted or surveyed and agree, I can’t see a problem with the parks being sold off. Some of the parks are so small or lacking in usable infrastructure that the only people using them are drinkers of alcohol or persons on their way over fences to homes for unlawful purposes. The problem will come from the sales when whoever buys these parks tries to build houses or units on their newly acquired land, then the people ambivalent about parks, but against development will appear from nowhere. So if people who live next to a park or near a park want to retain the park and/or don’t want houses or units over their back or side fences or more people living in the area they will need to speak up now. They should also be reporting all unlawful activities in or near these parks to the police and any maintenance issues or improvement ideas to the council, so the parks remain in an optimum condition for their intended usage. I am assuming you have a car capable of easily transporting four children and at least one adult from the Old Eastside to Larapinta. Other families, especially those living in The Gap, are not so lucky. I agree with you that Council may be onto a good thing with a degree of rationalisation of our parks. However I would rather see them sell the parks that really are not capable of being developed into a useful open space, and leave those, no matter their size, that are used extensively by the nearby residents. The Draft Urban Open Space Assets Report is worth a careful read. And just where are the children supposed to play? Why don’t they improve the parks and make them more locally suitable – eg more shaded areas for the summer. Some of these small parks are close to where young kids live – but I guess the young kids don’t have any voting power and it is not necessary to consider them. Some young mums don’t have a car – but they have children between a day old and 3 or 4. I guess it is the ones that have cars to add to the pollution rate that are to be catered for. First a disclosure: While I live next door to Walmulla Park I feel that whether it is sold or not would have a minimal, if any, impact on my life or on the value of my property. I ask these questions not from a personal interest but in the interest of the residents and the children of The Gap. In the Draft Urban Open Space Assets Report, why is Walmulla Park listed as not used at all and no potential use (item G on page 17 and then carried to the table on page18) when it is continually used by the adults and, especially, by the many children living in and visiting The Gap? Has it been noticed that while this factually incorrect statement is repeated on page 22, also on page 22 Walmulla Park is acknowledged as only one of very few (3) parks within the precinct, a precinct clearly overflowing with young children? In the same vein, has it been noticed that Walmulla Park scores its highest rating in the draft report (item B on page 16 and then in the table on page 18) by being the only park within a 400m radius? Are the adults and the children of The Gap to be penalised simply because they are not as vocal as the residents surrounding both Finlayson and Ashwin parks (pages 37 and 38)? Is it of no concern that Council will be seen to be disadvantaging the already marginalised, the bureaucratically mute? And finally, I wonder that if Walmulla Park, at 1,270 sq. meters, is deemed too small to retain (pages 22 & 43), what will be the size of the remaining public areas in Ashwin and Finlayson Parks if they have partially sold and reconfigured?